We have this in the cabinets under our sink. It really is a space saver and I am so glad I gott this item! I have very limited cabinet space so this is a great 'mulitplier'. Used for storage under my sink, It was perfect to organize cleaning prouct. It's exactly what I wanted, since I had a small amount of space and this item allowed room for some things that found a nicely spaced "home"
Small, narrow cabinet! This holds lots of items! This is wonderful storage for narrow cabinets under the bathroom sink. Holding extra toilet paper on top with creams and lotions held in bottom rack. This is exactly what I have been looking for, should have found these sooner!!! I have limited cupboard space and with that there was wasted space, but now it is all organized. Had my bathroom remodeled and a large, tall cabinet removed leaving storage in only the under the sink cabinet. These were my answer. I love them, especially the sliding out part to find items. May order a few more! My advice is to measure the cabinet first and check it with the size of the units as I couldn't use mine where I originally planned, but it works better where I put it anyway! I have several for different location in the house where I needed more storage. I use it to organize food storage containers and their lids, The shelves slide out for easy access. I might get another one for wraps-aluminum, cling wrap, wax paper and assorted size freezer bags. Haven't gotten around to assembling yet. Hopefully, they'll prove useful. This is a good buy perfect size under the cabinet, narrow enough to free up much needed space. My only complaint is the wire racks, smaller things fall through. 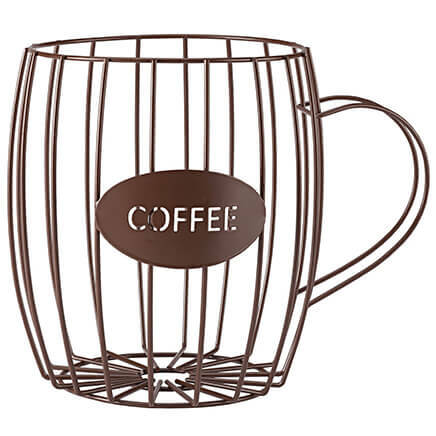 Perfect for medium to large items but not stable enough for the smaller items. I used mine in the cabinet under my sink. Even unattached it is stable and gives you a little more storage space and stores smaller items under there a lot neater. I already have 4 of them and really love them. Handy because they pull out to see what is stored in the back.It's like having 2 shelves. I can see what I have and what I need more easily in terms of brushes, cleaning pads etc. & I don't have to move big heavy items around searching for smaller ones that might have been pushed around under the sink. I just look in the wire basket. Easy neat and tidy. I bought three of these for under the sinks in my kitchen and bathroom. My pantry has a shelf that has extra space for very tall items. I only use half of the space provided. This will allow me to have an extra shelf in the other half of the space. This works really well in my small bathroom under-the-sink cabinet. the backs of the shelves though to keep them from sliding off the back, while traveling. Great to corral all those similar items! No more broken bottles of flavorings, no more lost spices. All in safe and findable order. I had ordered these several years ago and wanted more. I love them and they are a space saver in the cabinets of the bathrooms and kitchen. Bought this to organize under my bathroom sink. I love it. I should have ordered two while I was ordering. Great company. Absolutely no complaints. I have absolutely nothing derogatory to say about this company. Everything I ordered is as described except for one item of which they made right with me. I recommend them highly. 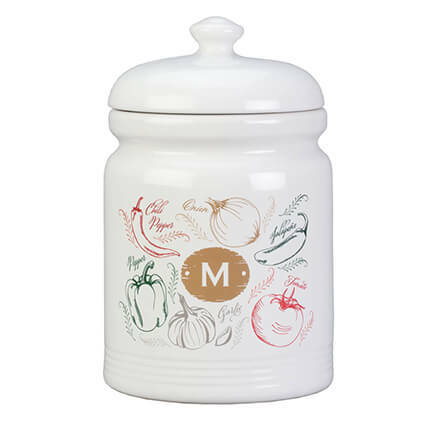 Great for storing onions and potatoes in the cabinet. Like these little bins. Perfect for small items. these things are great! my sink was a mess underneath, now I can find things. wish I'd have got them years ago. I am using the product in the cabinet under the bathroom and kitchen sink. It makes articles easier to find without getting down and digging to find what you need. I had to get someone to install it, due my inability to do it myself. Matter of getting down and inserting the anchor screws in the wood. This make the basket more stable. This is the best product for storing things under the sink. It is sturdy and big enough to hold all the hair care products. I wish they made one a little skinnier for smaller spaces because it is a really great space saver. I place my boxes of frozen food purchases on end on both shelfs. This makes for ease in accessing the box I'm looking for. Plus it takes up less space. 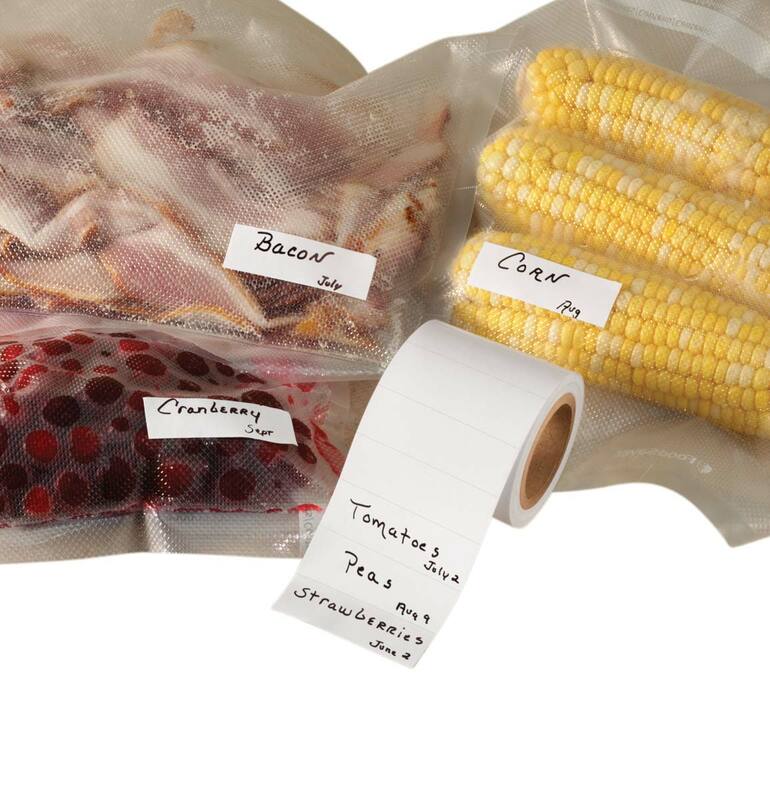 I have purchased a second one for bags of frozen fruit and the food saver packets that I have made. 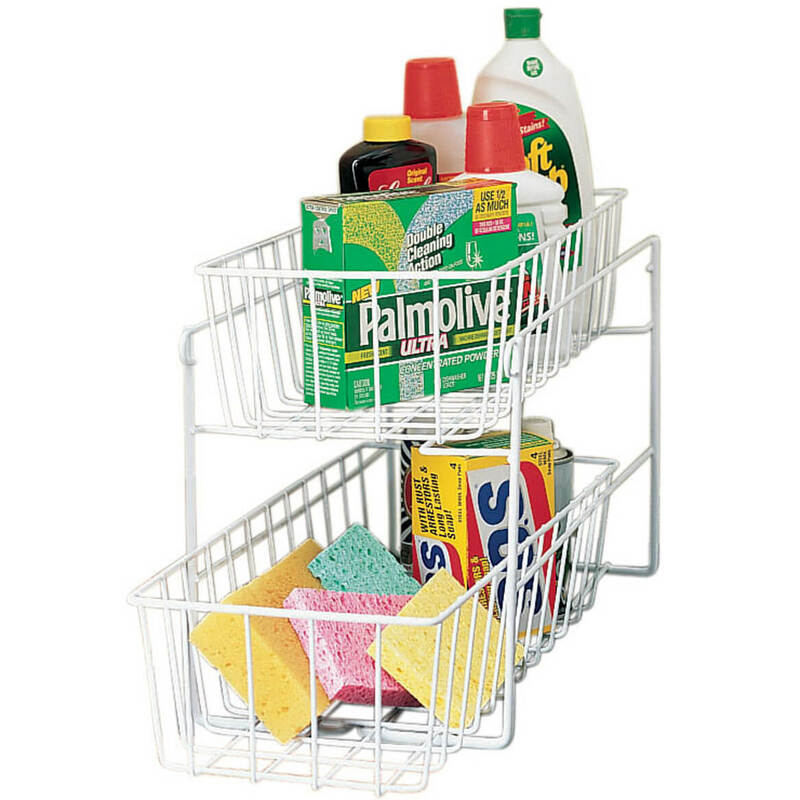 This is very useful for organizing small kitchen pantry items as well as bathroom and other uses. The wire shelves do slide conveniently, after some little adjustment. I put some craft poster board in the bottom of each basket to reinforce and smooth the inner surface. These sliding shelves are very versatile for many uses. My hubby was very happy to get all the medications in one organized place. In the bottom cupboard it's hard to reach meds that have gotten pushed to the back. I know my knees can't handle it. Yours probably can't either. This is a little flimsy, but it serves it's purpose nicely. I wouldn't use it for can goods, but it would work great for packaged noodle sides or gravy packages. I liked the fact that you can remove the racks up to your height and not have to bend over the whole time you are looking for that special medication. Let's face it I don't like bending, kneeling or stooping period. Perfect for me,who can't get down to the bottom cupboards for my canned goods and cleaning supplies. It's also more affordable, easier to install and just as sturdy as higher brands on the market. It provided great storage in my kitchen cabinet and bathroom cabinets. a little flimsy....and would be way better with smaller openings to be able to store small items. I think the drawers should have stoppers to prevent them from coming out all the waywhen you need to take something out. It saves space, but a little flimsy. Found a sturdier one locally. I need to get out more. I bake a lot and it works well to store my baking items so I'm not having to rummage around to find what I need. I love the fact that the bottom drawer pulls out, however, the top drawer needs to have a larger base. The baskets are the same size, however, the top shelf falls sideways a lot because the slots are almost the same size as the baskets. This is perfect for those disorganized under the sink places. Makes finding your supplies easy. I bought two for my bathroom cabinets. Helps to keep items from getting lost in the back of the cabinet. Organizes the most used items for easy accessibility. It is a bit flimsy, but with proper placement of items so weight is evenly distributed, it works well. For convince in small spaces great organization shelf. Because I have short arms and can't reach in the back of the cabinet under the sink. had one before our move. It worked good. So wanted an other one. 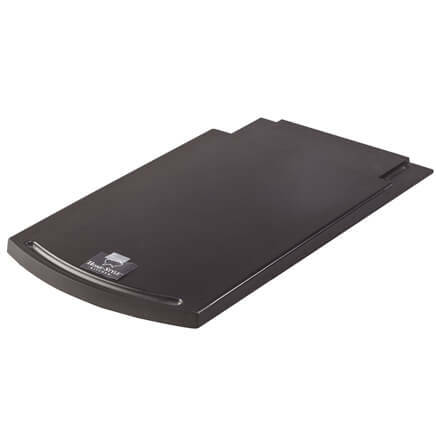 I have purchased one of these before for bathroom items organizing, and was needing another one for kitchen items. It works great for that purpose and It was also on sale which made it even better. I need a handy compact storage unit for a cleaning cabinet. I had one years ago and when I saw this decided to replace my old one. I needed something underneath my bathroom cabinet. Need to keep things organized better in my bathroom cabinet. My mom has one and I appreciate the ease of getting to items in the back. I thought this would work for more organized storage under sinks. To organize my bathroom cabinets. About to get a new kitchen. Need help organizing items under my sink. Need to improve organization in Bath and Kitchen. Small apartment, minimal space for storage. This 2-level sliding shelf will help solve some of that problem!!! Needed extra storage under sink in an organized matter. We have moved to a retirement community, and after 46 years of living in a big house, now live in a small apartment. Space saving is king! Works great in the cupboards of my RV! I need more space under my cabinets. The space under my kitchen sink is very cluttered. I'm so tired of pulling out and putting back cans in my cupboard. This sliding shelf will make them much easier to get at. The organizing items such as the two level shelf helps start the spring cleaning with the best results. Somewhere to put each product that makes sense. Had them in my old home and need them in my new home. Great and inexpensive way to get much more storage. To organize items into a neater, compact way and mainly for the two-tier utilization. I have several of these and use them under the sink and in the linen closet. 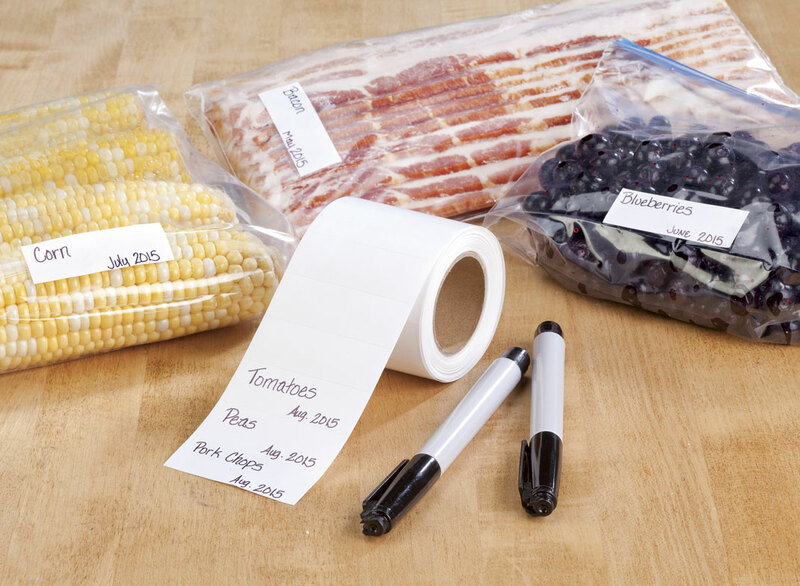 Makes it much easier to store, organize and find smaller items. I need shelfs for bathroom & kitchen cabinets. I wanted something to organize under my sink cabinet that would be easily accessible. Chose this to help organize my kitchen supplies. This will fit great in the kitchen under sink cabinet! Hoping to organize our bathroom items. BEST ANSWER: Thank you for your question. The shelf measures 15 1/2 x 7 1/2 x 11 1/2; 4 1/4" deep baskets. We hope this information will be of help to you. My cabinets have a lip approximately 1/2". Will this work if attached to the bottom of the cabinet? BEST ANSWER: Thank you for your question. A lip on the bottom of the cabinet may prevent the bottom shelf from properly pulling out. We hope this information will be of help to you. The wire drawer will not pull out. But, you can still use it. very flimsy, I doubt that it would hold up to attachment.